Join the Queen of Gold, also known as Cleopatra on her very own slot game by Pragmatic Play. This beautiful ruler is featured on a 6 reel and 25 payline slot, which comes with innovative and rewarding bonus rounds and features to help you throughout your gameplay! 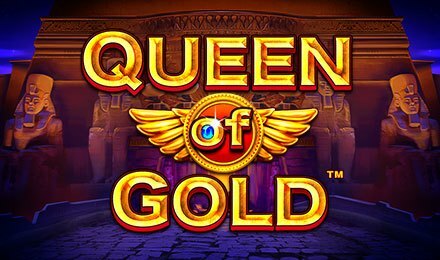 On the golden reels of Queen of Gold slot, symbols you will come across are; Cleopatra, Anubis, Bastet, Horus, Pharaoh Tombs, Pyramids, K, Q and A. These are the symbols that will land in combinations of threes to trigger wins! Start your gameplay by setting your stakes and bet levels on the bet tabs. Access them by clicking on the + or – button on the left and right of the spin button. Once you’re done, click on Spin and watch the reels roll! Autoplay is at hand, and you can select from 10, 20, 30, 50, 70 and 100 games to put to play! The multiplier reel is the 6th reel found in the game. Any win achieved on a spin is subject to the multiplier the reel stops on. The value of the stake multipliers ranges from 2x to 10x and increase as you level up. The wild symbol is the Pharaoh’s Tomb, which replaces all other symbols bar the bonus to help form winning combinations! The bonus symbol is the Pyramid, which triggers a bonus round on this slot game. Landing Cleopatra symbols in the golden circle located on the reels will collect them. Gathering five of these symbols within 25 spins will cause you to level up. You could also level up if a joker appears on the multiplier reels. The golden circle can be moved to wherever you feel like. Land 10 free spins by lining up three or more of these bonus symbols anywhere on the reels. The multipliers from the triggering game will remain active, and Cleopatra symbols will not be in play! Retrigger Free Spins round by landing more bonus symbols during the play of the round. If you’re ready to get started, launch the game on your mobile, PC or tablet at Vegas Spins and enjoy cutting-edge graphics, sharp sound effects and smooth gameplay!